SARA started 2019 in grand fashion with its first meeting of the new year on January 8. The meeting was very well attended with many familiar and new faces in attendance. Thanks to all who attended! A portable or handheld antenna and receiver are typically used to detect the signal. With the use of a compass and as few as two receivers (or readings), the signal can be located by use of triangulation. Attenuation will be beneficial as the you get nearer to the signal. The same equipment and techniques can be used to locate line noise in the power company’s electrical distribution system. Did you know that radio direction finding is done for sport in some regions? Find out more here. It was a cold and stormy December in 2013. 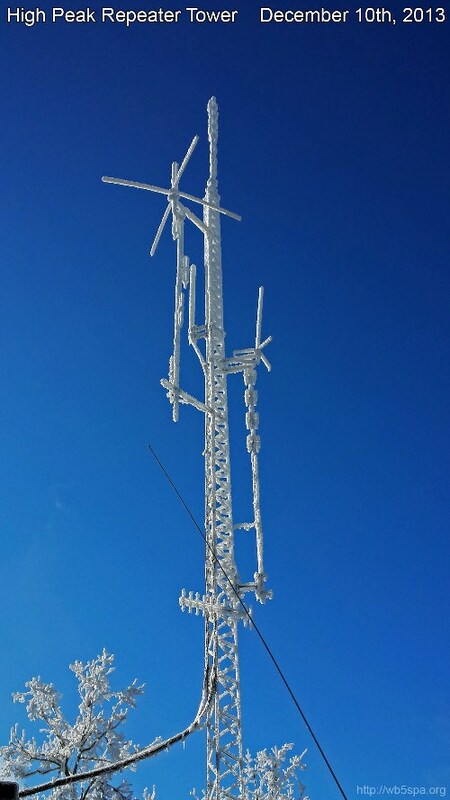 A winter weather event turned the repeater tower on High Peak into a RF flavored popsicle.